Hello, Friends! I hope you all had a great holiday with your families and friends! I know that I say this every month, but I AM ON A ROLL. Boom. I've read 47 books so far this year, and I have a bunch planned for the long break from work that I have in December. I'm going to have to up my goal to 50 next year! 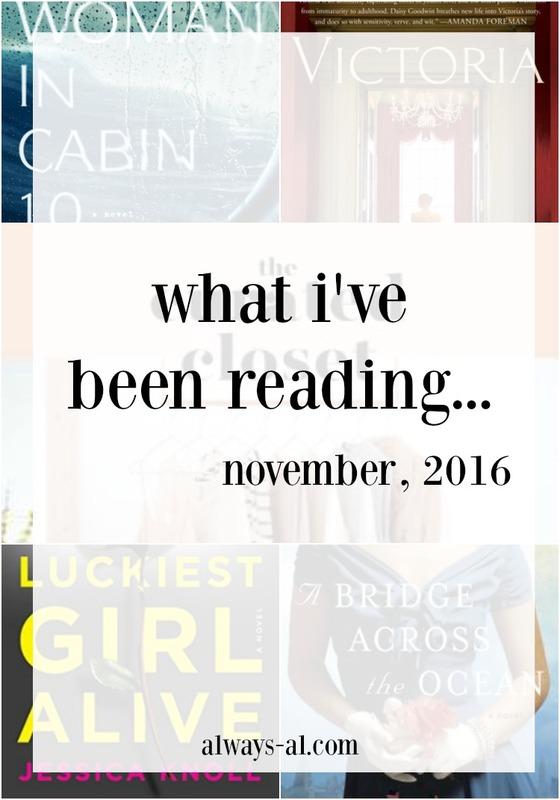 I can't help but be proud of myself for all that I've read this year. My mind feels like it is getting more inquisitive, and I love that I have become part of a community of readers in my area. Also, NetGalley has been such a resource for me! If you aren't a member, you should definitely apply! Right now I have a bunch of stuff to read, but as always, if you have any suggestions, please let me know! I am hoping to really get a lot of reading done over the holidays! I chose this book because the summary sounded like something I would really love. I love historical fiction, so the plot really appealed to me. I loved that all the women's stories were tied together, and you got a glimpse into the lives of many different characters and personalities. My favorite character was Simone, but I really identified with Brette. It was easy to follow the plot even when it switched back and forth, and I found myself wanting to see how their stories connected. I did not love the ending, however. I won't spoil it, but it leaves something to be desired. I was like "Really?! That's it?!" For a well-written novel, the ending seemed very hurried and not thought out. *This book was provided for review by NetGalley. All opinions are my own. The idea that people should invest in their wardrobe as well as in themselves is a great theme. The book demonizes fast fashion a little bit, but also gives solutions for shopping. I think this book was a little too long and could have been edited. This book is a great resource for anyone who wishes to update their wardrobe, and hone in on their personal style. There are great tips and guides for building a stylish wardrobe that represents you, as well as fits correctly. Some of my favorite chapters were about building a capsule wardrobe, what to wear to work, and creating a color scheme for your wardrobe. *This book was provided for review by Blogging for Books. All opinions are my own. This book was super weird. I listened to it as an audio-book, and I kept wondering what was freaking wrong with Ani. She just was really intense, and obviously had some issues going on. I didn't like her. I did like that that the book showed what became of Ani after the horrible tragedy in her life. I also liked that nothing came about between her and Mr. Larsson because I think that would have derailed the whole plot. And I was really happy that Ani didn't just go through with the wedding because she felt pressure to. This was my book club's selection for November since everyone in the group loved Ruth Ware's other novel, In a Dark, Dark Wood. I didn't love Dark, Dark Wood, but I liked it better than this book. I felt like it was the same storyline, with different details. One of the questions in book club was what we imagined Lo to look like. I think she probably looked exactly like Nora from Dark, Dark Wood, because They seem like exactly the same character to me. 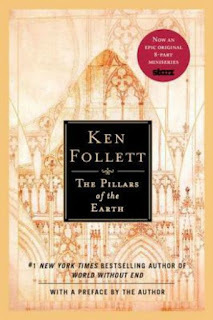 I JUST finished this book in time to include it in November. I read Daisy Goodwin's book An American Heiress earlier this year, and I love how she uses history and historical details to create a fictional story. It is so well researched and thought out, that sometimes I have to remind myself that this is ACTUALLY fiction. I read that this novel is based on Victoria's extensive collection of personal diaries, which gives an awesome insight into her thoughts and feelings. This book details the life of a young Queen Victoria, and when she comes to power in England. It explores her attraction to Lord Melbourne and her feelings on young Prince Albert, in a way that is very identifiable to any young woman. 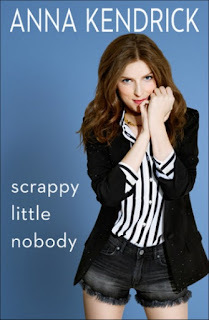 I'm still working on The Pillars of the Earth by Ken Follett, and am about to start Scrappy Little Nobody by Anna Kendrick for December Book Club! I love reading memoirs by influential women, and hope that this one will be as funny as some I've read previously (like Bossypants and Yes, Please).